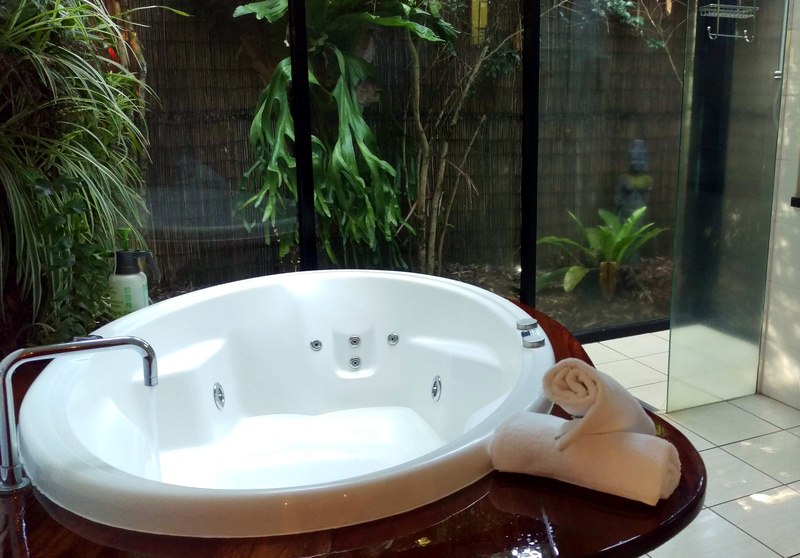 Mt Tamborine is a great overnight or even longer romantic escape from Brisbane or the Gold Coast. 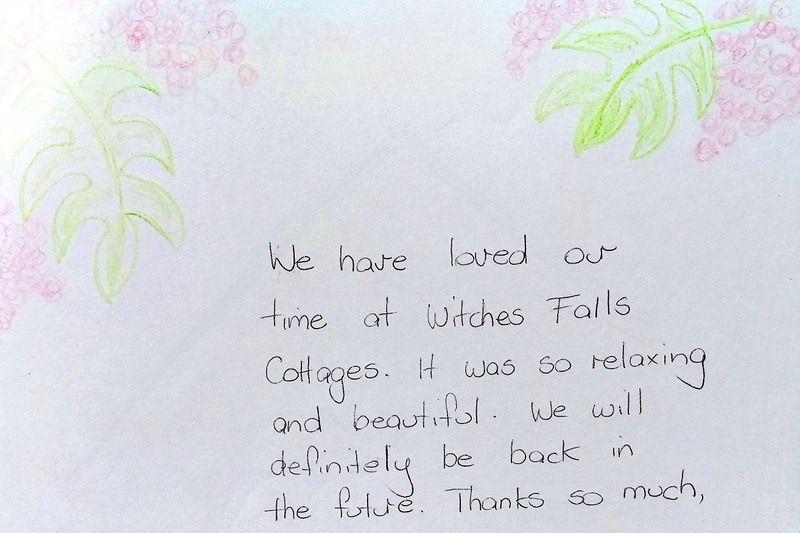 One of the nicest places to stay there is Witches Falls Cottages, which has private cottages nestled in a rainforest garden near a great rainforest walk, a great sunset lookout and within walking distance of several restaurants, wineries and even a micro-brewery. 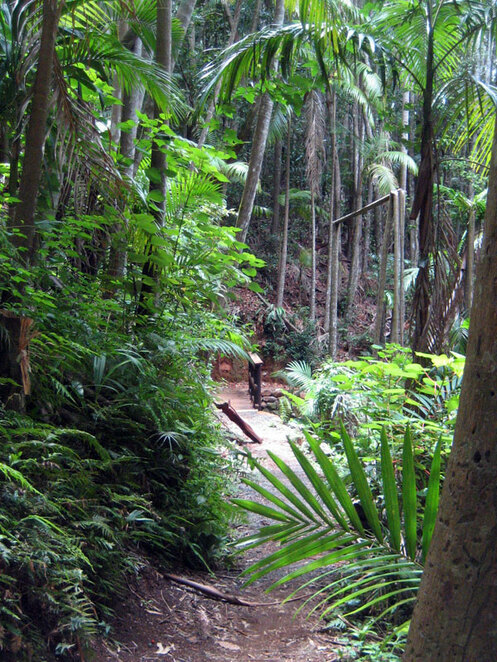 Mt Tamborine is one of the easiest mountains escapes from Brisbane or the Gold Coast. 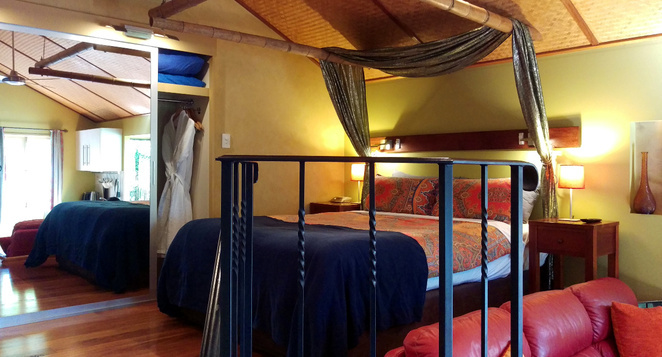 The area itself is a township that includes farms, wineries, shops, breweries, a distillery, pockets of national park with rainforest and waterfalls, great restaurants, cafes, tourist attractions and a wide variety of accommodation from the basic to the luxurious. What you have is a great natural area with a relaxed feel, but you still have plenty of attractions and amenities available that make it a perfect tourist destination, whether you want something free, cheap and quiet, or you prefer to shop, dine in fine restaurants and enjoy great wines. There is no ideal season to go to Mt Tamborine as it is a great destination any time of the year. In Summer it is a cooler break from the heat of the cities, in winter you can enjoy the cooler weather around the fireplaces that most accommodation offers. Spring and Autumn have warm days and cool nights, so you get the best of both experiences. The Witches Falls Cottages take their name from the fact that they are right next to the start of the Witches Falls Hiking Circuit and have a great reputation as private and romantic cottages in a nice location that is away from the central hubs of Mt Tamborine but also are within walking distance of many attractions and amenities. 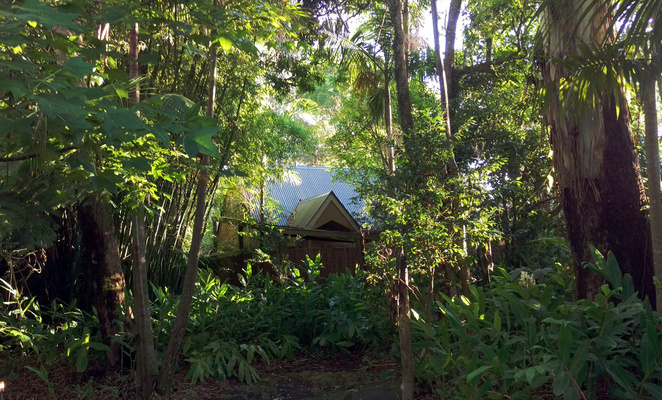 On the outside, you can catch glimpses of the cottages between the rainforest garden that isolates the accommodation from both other cottages and the rest of the world. On the outside, the stone walls and corrugated iron roofs give them a rustic feel, but inside the styling is more like a Balinese hut with wood floors, wooden carved furniture and tropical plants. Once you enter your cottage you immediately feel you are in your own special world. Of course, each cabin has a spa bath and a glass-enclosed shower that look onto your own private garden area and up to the sky. 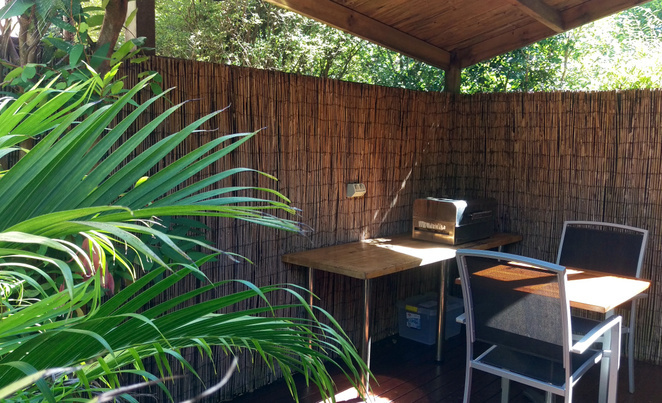 There is also a little barbecue yard perfect for 2 people to sit and relax in nature and enjoy breakfast, a meal or a glass of wine. One of the highlights is the breakfast. Each morning a hamper will be delivered to your door for breakfast. There is a choice between a barbecue or a cold breakfast filled with locally sourced products, and it gets so local that you the eggs will come from the chickens in the cottages coop and along with some of the fruit and vegetables from the garden. While the barbecue breakfast sounds great, I don't normally eat so much bacon, sausages and eggs for breakfast so I would recommend the cold breakfast. One thing is that the breakfast is so big that you will have plenty left over. So plan it will well and you can make some sandwiches from the bread and meats for a snack or even lunch. There are plenty of things near the cottages. Witches Falls Circuit is a 3.1 km rainforest circuit that starts just over the road from the cottages. It is a great early morning walk to build up an appetite for breakfast. Next to this is Rotary Lookout, which has great sunset views. Though of course, you can enjoy the view at any time of the day. Mt Tamborine is well known for its wines and there are 2 wineries close by, which are Witches Falls Winery and Mason Wines. The Witches Falls Winery has a better atmosphere while Mason Wines has dining. 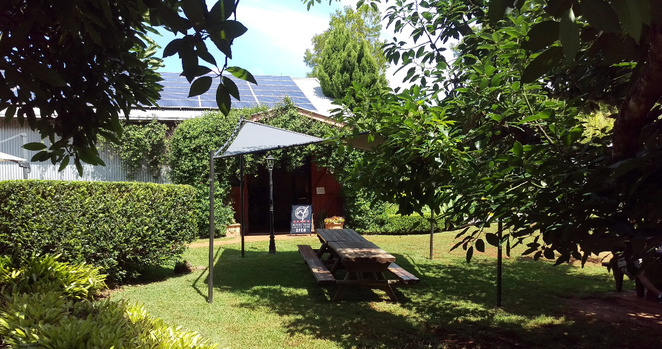 Of course, there are many other wineries on Mt Tamborine to explore. There is also a Bavarian Restaurant right next door to the cottages. While it has great ambience, the food is not as good as some of the other restaurants in the area. However, that shouldn't stop you from popping in to enjoy the beers brewed at the attached Red Baron Brewery. But there are a few other restaurants in walking distance as well. A little further away, there are the Glow Worm Caves, which give you an opportunity to see glow worms glowing during the day in a purpose-built cave. Witches Falls Cottages also offers a Hot Air Ballooning Package and many people take the opportunity to enjoy a romantic balloon flight along with their stay. The nearby locations barely cover the attractions in Mt Tamborine and I can't cover everything here, but here are some of my highlights in no particular order. First of all, the Mt Tamborine Botanic Gardens is a great local gardens maintained by mostly local volunteers and is well worth visiting. It includes a rainforest section with artwork and interactive installations the kids will love, a Japanese Garden and a nice pond section that is great for picnics. 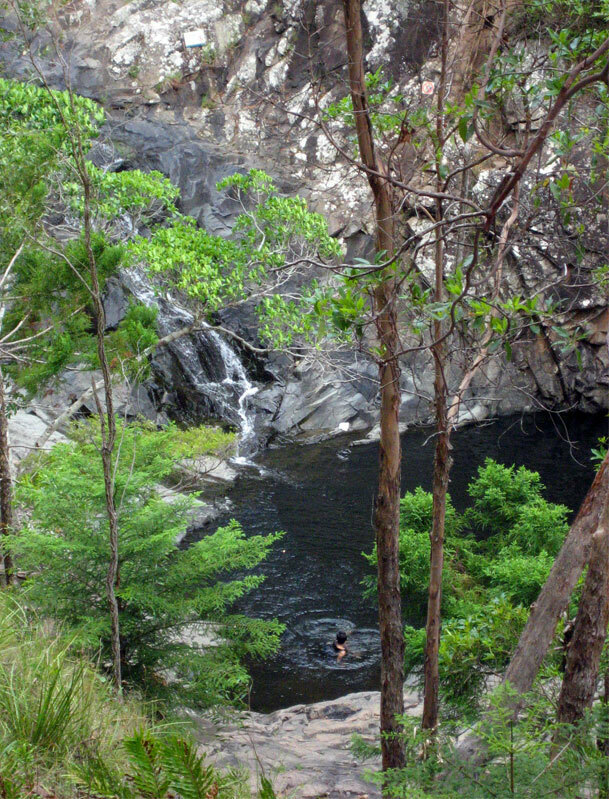 In summer it is great to head to Cedar Creek Falls for a swim. Be aware that everyone else has this idea as well and parking is limited, so you either need to arrive earlier in the day or late in the afternoon to find a car park. There are three pockets of national park on the mountain, including Witches Falls Circuit, Curtis Falls Track and my favourite, Sandy Creek Track. All are very lovely and relaxing walks and none would be considered hikes. 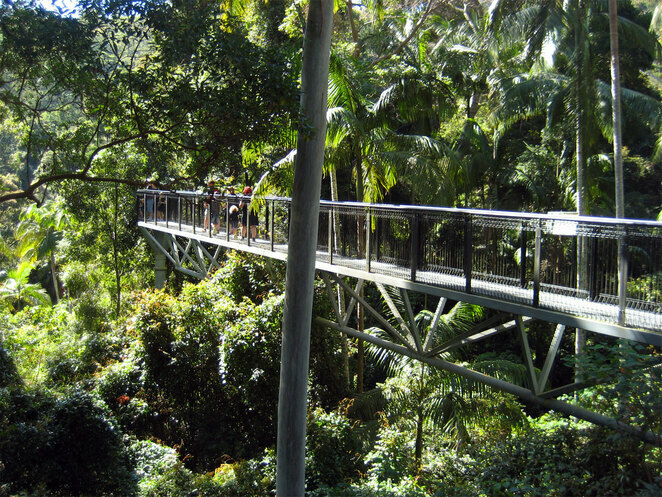 Many people choose to experience the rainforest from the treetops at the Mt Tamborine Skywalk. This is well worth a visit for visitors to South East Queensland. There are still many other attractions and activities on the mountains, including live entertainment in pubs and restaurants, a classic cinema with canvas chairs, a local theatre club, horse riding, the treetop challenge and more. Of course, you are not obliged to do any of these activities and you can just relax and enjoy the tranquil mountain environment. Mt Tamborine is only 1 hour and 15 minutes drive south of Brisbane and as little as 30 minutes from The Gold Coast. Unfortunately, there are no buses or other public transport to Mt Tamborine, but you can book a transfer service which will cost $40 per person to and from the nearest train station. A taxi from the same location is $100. Mt Tamborine is too big for getting around the whole area on foot, but you can usually visit a number of places near Witches Falls Cottages simply by walking. In fact, the cottages provide torches in each cottage for people who want to walk to a nearby restaurant at night. The main way to get around is by car and there are several roads across the mountain and nearly everyone drives at tourist speeds, so a tourist you won't feel rushed. Though please, if you are going to enjoy the many alcoholic options on the mountain, remember there is always the local taxi service. Mt Tamborine is a great escape from Brisbane or the Gold Coast even for a day trip. It is definitely worth staying for at least one night, but you can spend several days there to experience everything. 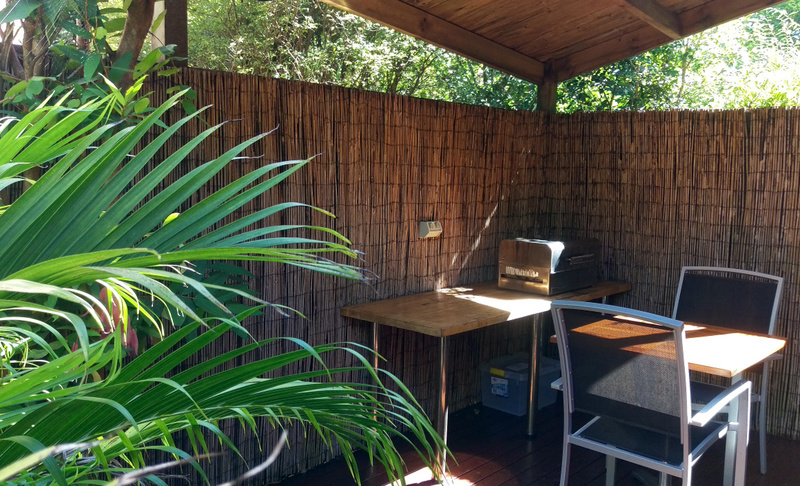 There are plenty of accommodation options on Mt Tamborine, and Witches Falls Cottages provides one of the great romantic escapes with cottages designed for 2 in a quiet and private setting. The lack of an attached restaurant is actually a bonus because you don't have casual visitors at the spot and you can spend your vacation in beautiful isolation with the feeling you are alone in the world with your partner. 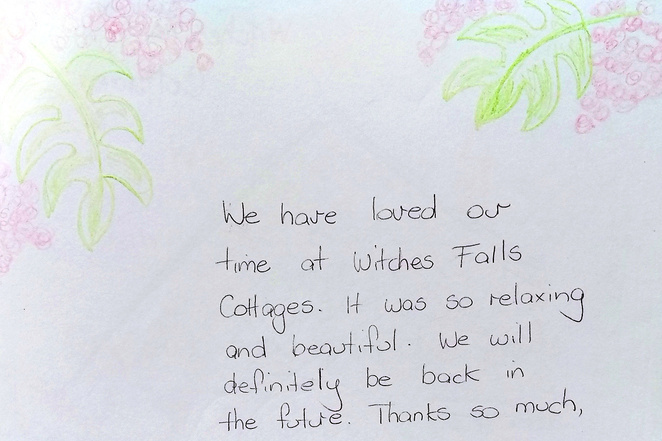 You don't have to take my word for it, below are just two comments from other guests at the cottages. It is definitely a place to go for an escape. I am impressed by the breakfast hamper. Not only for the food, but the lack of plastic packaging. Looks and sounds fantastic, Roy! Will definitely put it on my 'to do' list. Congrats on the Gold too! I used to live at Mt Tamborine and it is truly a beautiful spot.